As part of our Junior Design Research Studio, we were commissioned by Fiat Chrysler Automobiles to investigate and imagine the future of autonomous transportation in the year 2050 and beyond. We were given the freedom to pursue many different avenues of research, culminating in a presentation of our findings to members of FCA's User Experience and Industrial Design teams, including Ralph Gilles, Global Head of Design. My team chose to focus on transportation as it relates to the world of work. Travel to and from work makes up a significant part of people's relationship with vehicles and the transportation industry. We started from the premise that commuting is lost time. In a future centered around autonomous transportation, when people no longer need to drive themselves to work, we wondered how that time could be made more valuable. Can design help workers transition more easily between home and work spaces, even as that distinction becomes less clear? SCOUT is a virtual assistant to help commuters in the world of 2050 adapt to the fluid and rapidly-changing landscape of work. SCOUT uses augmented reality to help workers mentally transition between projects and locations, use virtual collaboration to fill in knowledge gaps within teams, and map out information spatially to help people understand it. 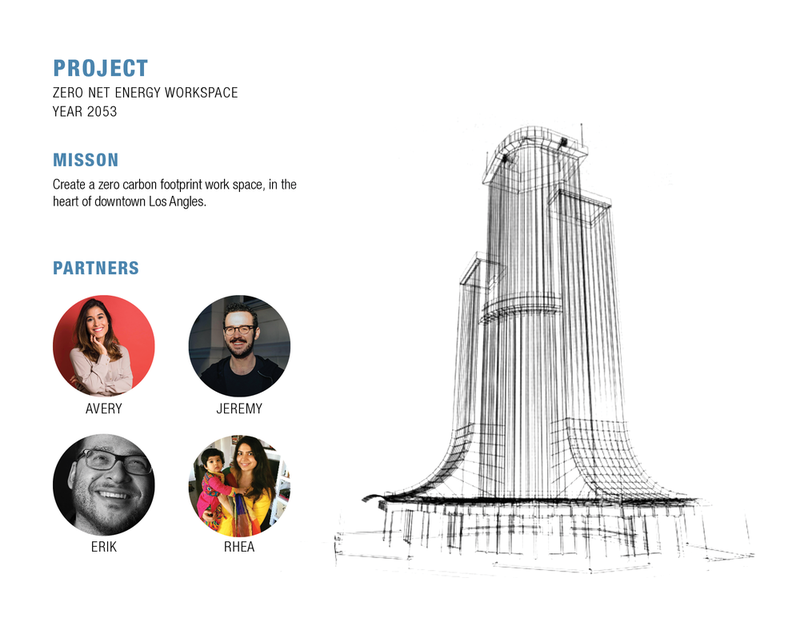 Avery, an architect, has just been matched with a new project—a zero-net energy workspace—based on her profile of skills and strengths. Today is her first day on the job, and she will spend her commute getting acquainted with the project and speaking with Jeremy, the project manager. Avery has chosen a Jeep experience for her commute. Her vehicle picks her up in the morning and SCOUT walks her through the agenda for the drive. She requests a stop for coffee and the agenda is updated. SCOUT helps workers make a natural transition between home and work spaces by intelligently providing targeted and progressive information that is relevant to the projects they are working on. Avery can see the first checkpoint approaching from a distance. When she passes it, she is presented with selected information about the project plan. The density and scope of information will gradually increase as she gets closer to work. SCOUT takes advantage of the setting of a moving vehicle by tying information to specific locations. Research shows that associating abstract ideas with spatial memory can improve comprehension and recall. 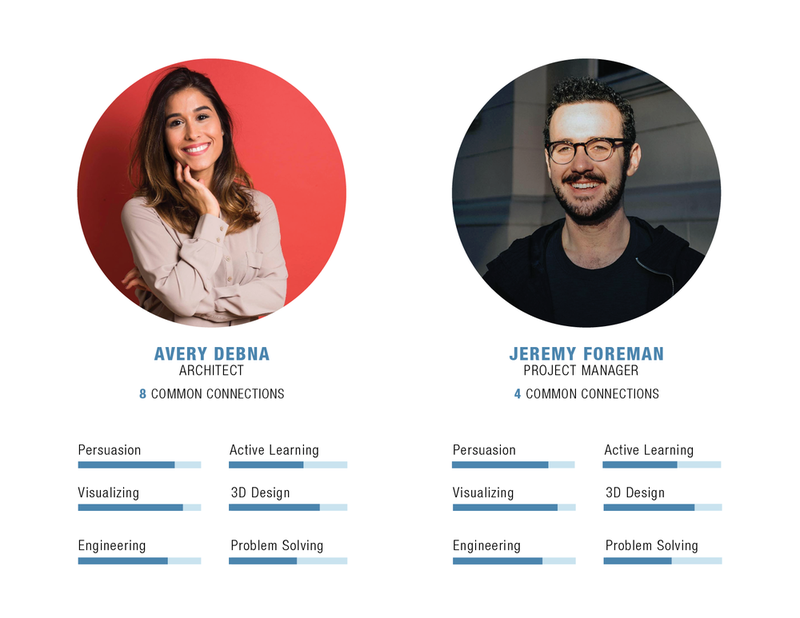 As Jeremy and Avery commute separately, the information they discover is customized to their unique path to work. Checkpoints are placed in physical locations, gradually bringing each team member up to speed as they get closer to work. SCOUT fills in knowledge gaps among team members on a project to help them keep up with the rapidly changing world of work in 2050. Now that Avery is up to date on the project, she is ready to talk to Jeremy. They chat virtually during the last section of their commute. Finally, Avery and Jeremy arrive at the job site together. They have each transitioned smoothly from home to work. Thanks to SCOUT, they are on the same page and can collaborate effectively as they continue their workday. We analyzed existing literature and designed generative research activities to better understand the future we were designing for. By 2050, advances in transportation technology will allow people to travel farther, faster, and more comfortably. These changes, combined with the effects of technology, specialization, and automation, will significantly alter the structure of the working world. Our research suggests that in the future, the rigid corporate ladder of today’s workplace will be replaced by networks of individuals with diverse skill-sets, working together on a variety of projects. In this so-called “gig economy,” cognitive, process, and social skills will be in high demand, and active learning will be essential as workers move fluidly between projects and teams of people. Generative research: what do people value? Designing for scenarios set far in the future meant that we had to think outside the box of traditional research methods. Since we couldn't directly study users' needs, we designed custom generative research methods to learn about people's values. We used these activities to understand people's attitudes toward concepts like home/place, collaborative building, and spatial memory. In the activity shown above, participants were asked to chronicle a day in their lives 30 years in the future, laying out a spatial narrative with the help of pre-made building block cards. 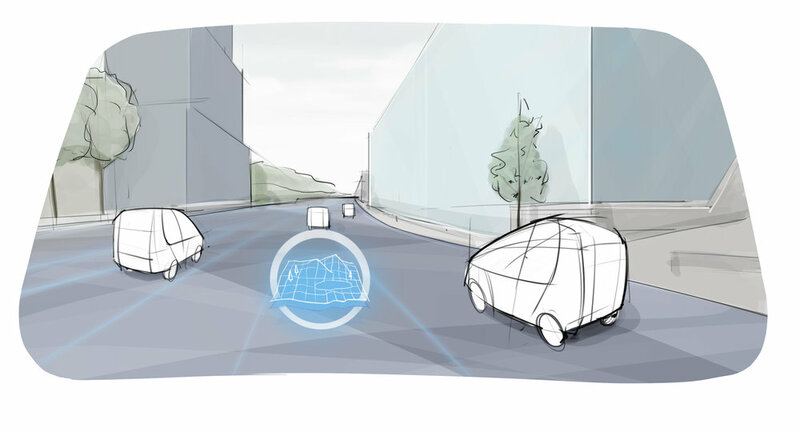 Informed by our research, we began designing a service based on shared access to autonomous commuting vehicles. Built in telepresence and AR technology helps fill in knowledge gaps between team members by providing them with targeted information before bringing them together for real-time virtual communication, as shown in this timeline. I created concept sketches to demonstrate the function of our proposed AR interface. Information would be presented sequentially, with consecutive checkpoints overlaid virtually on the real world. Commuters could see future checkpoints through the windshield as they approached. Once we refined our concept, I created a digital drawing of the car's interface, which we used in video renderings for the final product.